FIGURE 2 Results of the adaptive fuzzy c-means algorithm on double-echo MR data. 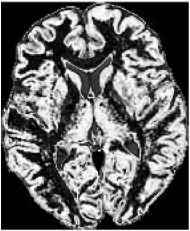 (a) PD-weighted MR image after preprocessing, (b) T2-weighted MR image after preprocessing, (c) maximum membership segmentation computed using AFCM, (d) gray matter fuzzy membership function, (e) white matter fuzzy membership function, (f) cerebrospinal fluid fuzzy membership function. FIGURE 3 Comparison among several segmentation techniques. (a) Original Tl-weighted phantom. Segmentation results: (b) adaptive Bayesian, (c) neural networks, (d) Parzen window, (e) k-nearest neighbor (k = 3), (f) nearest neighbor. Although the segmentation results may appear similar, the computed volumes for WM, GM, and CSF are in fact substantially distinct among the methods tested (as shown in Table l). See also Plate 14.
where s is the voxel being examined and q its neighbor. ¿6 is a parameter that controls the degree of smoothness of the segmentation. High ¿6 values yield greater dependency on the neighbors' classification. When ¿6 is equal to zero, the segmentation is based on the voxel intensity information only. Under this Bayesian model, the goal of the segmentation is to estimate mean intensity p and label image x, given data y. The algorithm maximizes the a posteriori probability jointly over tissue types and mean intensities in an iterative and adaptive fashion. For each iteration, it estimates the mean intensities for each tissue type via a least squares fitting of the B-spline function, and the tissue type regions modeled by an MRF. By increasing the number of control points of the B-spline functions, the algorithm slowly adapts to regional intensity variations that, in the case of MR images, may be caused by shading artifacts due to MR field inhomogeneities. The segmentation algorithm is fully automated. As an initial step, the algorithm presegments the data with a k-means clustering technique that groups the voxels in the image into k clusters through the minimization of the total intercluster variance (a maximum likelihood estimation). 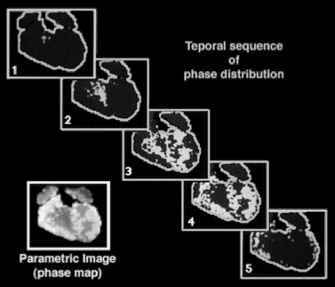 The result of the presegmentation is then used as an initial classification for the adaptive and iterative model. 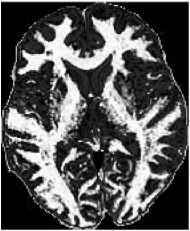 Figure Id depicts the segmentation of the brain image shown in Fig. lc with the adaptive Bayesian method. In Fig. 3, a qualitative comparison among several segmentation methods is presented. Quantitative results are presented in Table l.
Note that there is a fundamental difference between the way inhomogeneities are handled by the adaptive Bayesian method and the adaptive fuzzy c-means algorithm. The former method assumes that the mean value of each tissue class spatially varies independently from the other tissue classes. The latter method assumes that they all vary according to a multiplicative gain field. Both methods assume that the variation is smooth, however. It is unclear which of these models is more realistic, but the gain field model offers advantages of reduced computation and reduced model complexity.